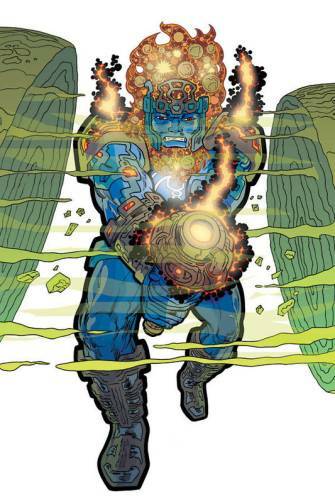 The talented artist Thomas Scioli is a former Xeric Grant winner (for The Myth of 8-Opus) best known for his Jack Kirby-inspired art and the collaboration that such an approach to the comic book page has afforded him with the writer Joe Casey on the cosmic odyssey Gødland. 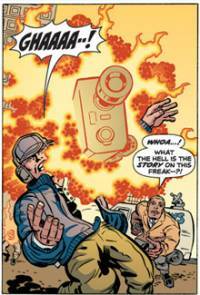 Casey and Scioli recently announced that Gødland would end with issue #36, a surprise in that the Pittsburgh-based cartoonist had expressed an interest in continuing with the series for the remainder of his comics career. He is currently reviving Myth of 8-Opus; a new issue will be out on stands this summer. I know nothing about Scioli other than that his fellow cartoonists speak highly of him and that he's one of the few comics creators with his level of production that also works a full-time job. TOM SPURGEON: You're ending Gødland; can you talk a little bit about why? Was there always a planned ending or is this something that arises out of sales? THOMAS SCIOLI: Sales. Of course it's sales. If the series were selling better we'd never end it. Sales are going down at a time when we really need them to be going up. It's a wide enough premise that I couldn't see ever running out of ideas for it, or interest in it. I could imagine fitting pretty much any kind of story I'd want to tell into it. The way things are going, its not going to go on forever. So do we keep going along as if it is going to go on forever, or set things in motion so we can end it on our terms, make it into something complete and meaningful? It was going to have to end some time. By setting a specific end point like this, we've given ourselves 12 issues to really build toward something big, rather than leave readers hanging. SPURGEON: Why announce the ending more than a year ahead of time? Isn't there a danger with serialized comics that if you announce an end, people won't start buying it? SCIOLI: I was hoping for the opposite to happen, that it would bring us to more people's attention, that over the next year things were really going to come into focus. Let people know they have a chance to be part of something special. It's exciting to be part of something at its beginning or at its ending. SPURGEON: What were your sales like with the comic books vs. the collections? Have there been frustrations about doing a comic like this one in this market? SCIOLI: The collections did a lot better than the single issues. The first collection was far and away the most successful book. Most of my earnings from this series are from that single volume. Before this series came out, I had a lot of assumptions about what would sell, and I was pretty much wrong. I thought that there was more of a hunger for this type of material. I know this is the kind of comic I'd like to see more of. Maybe my expectations were too high, though. I mean it is the most successful thing I've ever been involved in. We sold a lot of comics, relatively speaking, but the number you need to consistently sell to really make a go of it is awfully high. The main frustration is that I wish there was more room for us. It's crowded out there. I kept hearing from people who couldn't get a certain issue because their store sold out of it, or they ordered it but it never showed up at their store. Hearing that kind of thing makes me crazy. SPURGEON: In general, were you happy with the deluxe edition you guys did? Was there anything you'd change about it now? How did that do? SCIOLI: That Celestial Edition was incredible. I think it looks great. I'm really proud that my work could get that nice a presentation. I 'm extremely proud of it. It's definitely the best "relic" of my time in comics. How did it do? Not as well as I would've hoped. But it's got a long shelf life, so I see it improving in the coming months and years. I keep hearing from a lot of people who've only recently discovered the series because of the Celestial Edition. The reaction has been enthusiastic. This is going to be our long-term legacy. SPURGEON: I know that you're returning to your series, Myth of 8-Opus. What's the timing on that move, and why did you make that decision? SCIOLI: I've been wanting to get it going again for a while. I never wanted to stop. I had hoped that I'd be able to keep it going while I worked on Gødland, but it just didn't work out that way. I really got to missing it. It's just been way too long. When 8-Opus ended, it was in the middle of a sprawling multi-part story. I want to tell new 8-Opus stories and before I can do that, I need to finish what I started. I really missed working on something that was purely my own. I finally made the decision to really do it back in December. 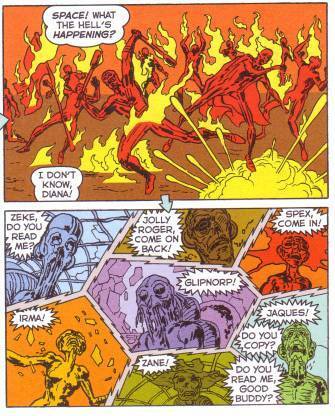 My hopes had been that once Gødland got on good footing, I could put out 8-Opus in color through Image. Then I found out just how bad things had gotten sales-wise with Gødland. I realized that if I'm going to continue in comics, it's probably not with color comics and probably not with a monthly. SPURGEON: Why start Myth again before the conclusion of Gødland? SCIOLI: I made the decision to re-launch 8-Opus before we made the decision to announce the end of Gødland. I wanted to start it as soon as possible. I want to put out new 8-Opus GNs but I didn't want to do it before I got the older stuff back in print. SPURGEON: How are you a different artist than when you last worked on Myth? SCIOLI: I think my figure work is stronger. I have a wider visual vocabulary because back when I did Myth, there were certain techniques that I purposely avoided because they were un-Kirby. I've got a better sense of pacing. I'm not afraid to let a composition breathe, whereas before I felt like I had to stuff each panel. I have better control of line. I do a lot less brush work, which could be a plus, could be a minus. I think there's a greater variety in my line work now. I'm a lot faster. I also have realized that I can draw something without having it look like Kirby and still have it look good and work good. I've also learned the importance of good anatomy and pretty women. Neither of those things were big priorities for me when I started. SPURGEON: Your "Space Smith" story was your first solo effort in a while. What do you think of that effort? What did you see once you were done with it that you hadn't seen in your comics before then? Was it a factor in deciding to want to go back to your own title full time? 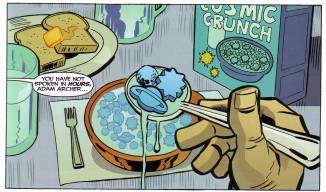 SCIOLI: By that point, I was really hungry to do something entirely on my own. When Erik Larsen offered it to me he said I can do as much or as little as I wanted. I told him I wanted to write draw and color it. I was really happy with how it turned out. It was the first time in a while that I created something practically out of whole cloth. I was less afraid to be overtly funny. I like the way the colors printed. I wanted it to give the reader the feeling that anything could happen, which is the appeal of Golden Age comics, that the rules hadn't hardened yet. I think the choreography with the spaceships was good. I also wanted to do the Hitchcock/DePalma thing where you set up a huge cast then kill them off in the first act. I wanted to fit an epic in six pages, really take the reader through a wild ride. When I did my story, I thought, "Man this is going to be the best story in here. I'm gonna blow everybody else away." Little did I know, everybody else was planning the same thing. I also took the opportunity to be more overtly humorous. I was always afraid of giving the reader an easy out, to not take things seriously. I've learned through Gødland that you can juggle absurd ideas, let the audience in on the joke, and still have them take the serious parts seriously. SPURGEON: Do you have any reaction to some of the reaction that hit Next Issue Project. It seemed to me that there were more negative reviews that one might think given the level of talent involved. Was there anyone else's work you liked? SCIOLI: I got the impression the reviews were much more positive than negative. It seemed like the negative reviews were of the type that anthologies always get, I liked this one and this one, but I thought this one sucked. Everybody seemed to have a different favorite and a different least-favorite which were often the same story. I think some people didn't know what to make of it. It was a really appealing idea to me. A lot of people were really jazzed to be a part of it. I think for some readers it was too Golden Age, but for others not Golden Age enough. To me it was pitch-perfect. I was really blown away when I saw it on the shelf. just flipping through it, it looked like nothing else on the shelf today. I thought it was an awesome comic. It was all good, but my favorites were Larsen's "Samson" story, Joe Casey and Bill Senkiewicz's "Time Travel" story, and Rugg and Maruca's "Captain Kidd." I liked the way they all aged their stuff to look like an actual Golden Age comic with the fake newsprint look. I've never seen it done quite that well before. Erik and Jim [Rugg] are both really fastidious about that classic coloring. They each picked up nuances in the old printing process that I wasn't aware of. Like how there'd be a double image of parts of the black plate. I thought, "that doesn't really happen" but then I'd be reading an old comic and start noticing it. "They were right!" I'm glad not everybody did that though, because I like the book's anarchic look. It was also a real treat seeing black inky art from Senkiewicz on simulated newsprint. He really knows how to slosh it around. SPURGEON: I noticed that you're credited as a co-creator with Joe Casey, just as Jack Kirby was with Stan Lee in the early Marvel years. Talk to me about how you and Joe work on Gødland. How much input do you have into the plot, storylines, characterization and scripting? SCIOLI: It's been an organic collaboration. As far as plot ideas go, I had way more input in the first few issues than I do now. In the beginning I threw a bunch of plot ideas at Joe. We threw a lot of ideas back and forth. There are a lot of my plot ideas in those first few issues. As the series went on it was less and less. Occasionally there'd be an idea that I had that would pop up in one of Joe's plots. 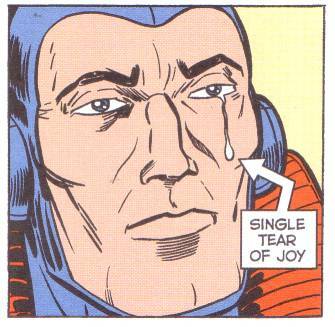 Now we're at a point where I'm as surprised as anybody when Joe e-mails me a new issue's plot. Issue #13 was an exception. I plotted most of that particular issue. When Joe and I first got together to work on this series, I kind of had a prejudice against mainstream comics writers. I thought I had to guard against the comic being too mundane, too safe. That's why I came in swinging, throwing in every idea I could think of. It didn't take long for me to realize the book was in good hands, so I stepped back and let Joe do his job. We were on the same wavelength. We both wanted to create something really outrageous. I had nothing to fear. It was tough for me at first, though. I'm used to doing everything myself. Of course, when you're working Marvel method, there are a lot of things that would be considered writing or storytelling that the artist is contributing. I do a lot of the pacing and staging. I'm responsible for most of the fight choreography. Sometimes Joe will ask me to come up with some aliens or something. I'll come up with unique powers, character designs, body language, all of those things that would fall in the realm of storytelling. For the most part, Joe comes up with the broad sweeps of the story and pacing, I'll break it down into the smaller pacing moments within that. We're each reacting to the other. Since the dialogue is done last, a lot of what the writer does at that stage is reacting to the expressions and body language in the artwork. When I finished the first issue, I had a very different idea in my head of what the characters would sound like, what the tone would be. In my head it was a little more earnest. When Joe sent me the dialogue, I was blown away. It was really laugh-out-loud funny. Particularly Basil Cronus, he really came alive, Joe really gave him a unique voice. Basil was kind of like our Silver Surfer. I came up with the character in a sketchbook, sent it to Joe along with a bunch of other sketches of potential characters. He really fell in love with it, and then gave him his distinctive voice. Unlike Stan and Jack, our collaborations are pretty well-documented. We ran some of our initial brainstorming e-mails in the Celestial Edition. Maybe in a future edition we'll run some more of that kind of stuff, plot synopses, etc. If anybody's interested. There are things in the series that are more purely Joe, and there are things in the book that are more purely me, but most of it is somewhere in between. SPURGEON: One thing that a lot of people don't know about you is that you work full-time. How are you able to manage your time so that you remain a productive comics artists while still going to work? SCIOLI: I have a very simple life. I'm married but we don't have any kids. Drawing comics is my hobby. I take my pages with me everywhere and work on them whenever I can find a spare moment, like on the bus, or during my lunch break. I never just sit on the couch and watch TV. If we're watching a DVD or something I'll usually have my pages. All those little moments add up. It's not easy though, and it gets harder every year. I wish I didn't have to work a day job. I wish I could support myself just drawing comics, but I haven't figured out how to make that work. SPURGEON: Are you friendly with other cartoonists in the Pittsburgh areas? Which ones? Is there a cartooning community there in town? Is there anything like a sensibility or a certain kind of humor that you might share with other Pittsburgh artists? SCIOLI: Yeah, Pittsburgh has a great bunch of comics artists, a very diverse group. I'm friends with Pat Lewis, Chris Moeller, Ron Frenz, George Broderick, Ed Piskor, Jim Rugg, Rich Yanizeski, Joe Jusko, Frank Santoro, Pat Olliffe, Dave White, and Mark Zingarelli. That's a wide range of approaches and sensibilities. There are some really great comics being made in this town. As far as there being a Pittsburgh sensibility? Solid draftsmanship. A strong cartooning bent. 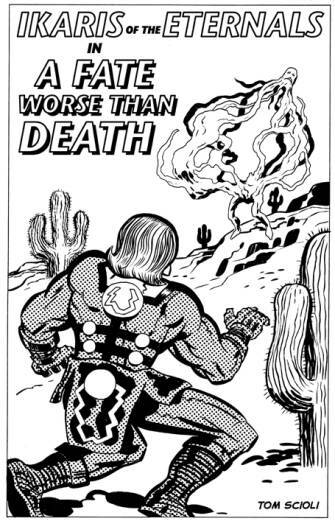 There are a lot of us that just love good old-fashioned adventure comics. Making comics that are serious without being sullen. I think a lot of us feel more of an affinity with comics' past than any current movement, but maybe I'm just speaking for myself. 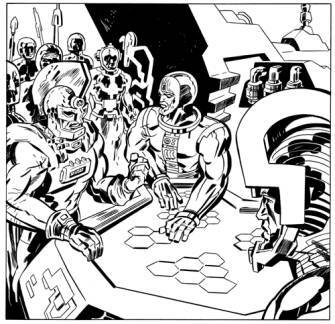 SPURGEON: I know that talking to Joe about Gødland, he's always been adamant that it was the cosmic odyssey in general that was being discussed rather than simply Jack Kirby's version of it -- and yet, you're best know perhaps for the Kirby feel to your art. Are there elements to your work that you can talk about that you feel aren't necessarily sympathetic with Kirby as much as another artist that drew cosmic odysseys of the Gødland variety? SCIOLI: We're both big fans of Nexus, so that's an influence. There's some [Jim] Starlin in there, too. Joe's the one who brought a Starlin influence to the book, not me. I started checking out Starlin's work only after we started the series. There are a bunch of comics I checked out because people were saying, "Oh, Gødland's like this or that comic." To me, the main influence was Kirby. Mine was mainly a Kirby-style cosmic odyssey. I've got a little manga in there, maybe some other influences there, but definitely way below the surface. People started mentioning Starlin, so I checked his work out, and I can totally see the similarity. Grant Morrison was another name that kept coming up. 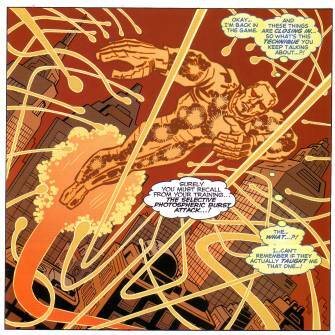 People were like, "Basil Cronus,that's the sort of whacky visual Grant Morrison would come up with," but to me it was, "No, that's the kind of whacky visual Kirby would come up with." "It's Kirby mixed with Morrison!" To me it was Kirby mixed with Kirby. 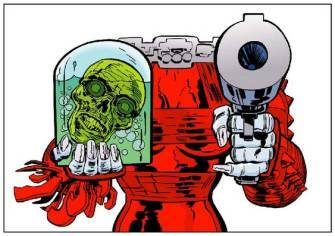 Look at Arnim Zola. Kirby designed some crazy stuff. But checking out Starlin and Morrison definitely made me into a fan of those guys. Adam Archer does seem like a Starlin kind of character. His whiny/badass ratio does seem to lean in the whiny direction, like Warlock. 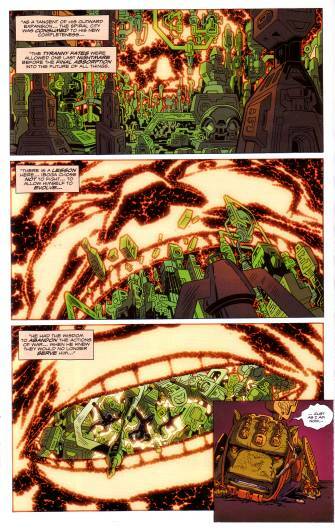 Nextwave was another comic people were telling me I should check out because it's got a similar tone to Gødland. 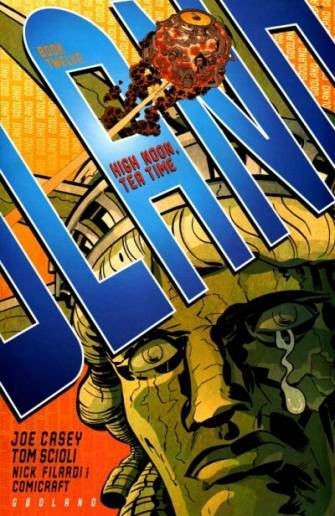 I liked that one a lot, too, particularly the Fin Fang Foom issue. SPURGEON: Can you talk a bit about your approach to character design? I think it's one of the more affecting things about Gødland. Do you sketch designs, plot them out in advance, work from a central idea or simply free associate...? I'm particularly fond of Maxim. 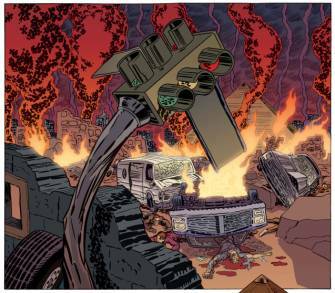 SCIOLI: A sci-fi series lives or dies by its monster and vehicle design. That's why Kirby was tops. The worlds, vehicles and props need to look cool. The aliens and monsters need to look cool. A lot of Kirby's contemporaries had amazing draftsmanship, but their aliens were those same generic Flash Gordon creatures. I like to mix organic shapes with technological shapes. I like hexagons, groupings of three, asymmetry. All things I learned from Kirby. They've become second nature to me, so I just let the pencil go where it's going to go. At the beginning, before we had any stories, I sent Joe a shitload of designs that I had sitting around, and a lot of new ones too. He picked through the toybox, and saw which ones he liked. Sometimes Joe will put in a special order, "I want something like this." SPURGEON: I was just looking at the latest issue, and I notice that you use a variety of physical structures on the page. Can you talk about some of the choices you've made in page design. What is it you're hoping for with across-page or across-spread tiers? With the single-panel pages, do you hope to stop the eye and allow it to drink in that single image for a slightly longer time? SCIOLI: I want to impart a sense of awe to the reader, make a moment larger, make tall thin panels, or super wide panels. Anything to vary the compositions. I started using those double-page-spanning wide wide panels in issue #1, at Joe's suggestion. I used them with greater frequency starting in issue #12 (again, Joe's idea). It's a good compromise between the double-splash page. It gives you the big moment, the feeling of awe, but doesn't cheat you out of story moments. We still want each issue to be as satisfying and full an experience as possible. It needs a certain duration. SPURGEON: You once wrote that you enjoy talking Kirby with people. What do people talk to you about concerning Kirby when you talk Kirby? 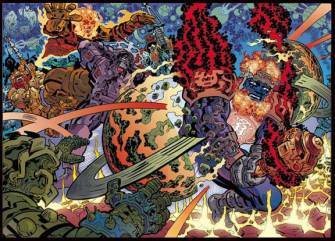 How do you feel about the sustained interest in Jack Kirby. Is there something under-appreciated about him that you wish received more attention? SCIOLI: Mostly it's talking to other addicts about your favorite high. Talking about your favorite stories, favorite series, which body of work is better, weird things you've noticed. What you've gotten out of his work. As far as something that deserves more attention, I wish there was more of an understanding in the mainstream of who he is and what he did. Every time there's a movie based on something he created or co-created he should get the kind of attention George Lucas gets or J.K. Rowling. I wish he were as much of a household name as Stan Lee. If you made a list of all the things he created or co-created, it's staggering. I also think his work is sometimes unfairly regarded as merely quaint or nostalgic. But to me his best work really has teeth. His work can be really frightening. I wish his 1970s Marvel work got more respect. It was a shorter period than his '60s Marvel work, five years vs. ten years. But to me it's the more interesting, more accomplished body of work. People over a certain age tend to dismiss it. To me it's some of his best work. I didn't grow up with the stuff so my reaction is divorced from its context, it's a reaction to the work itself. Maybe it's different for people who were there when these comics came out. Maybe in the '70s these comics were out of step. In 2008 they're visionary. His Fourth World work seems like it's finally getting something near the respect it deserves. I'm surprised by the reaction to the Omnibus, so many people writing about these stories saying how they've never read them before. That amazes me. I thought they were required reading for superhero fans. How can you be a superhero comics fan and only be reading them now for the first time? 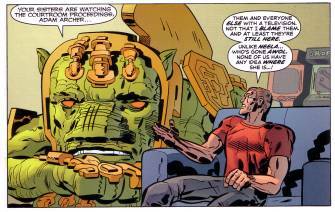 I also hate that every time somebody mentions The Fourth World, they have to say how it was a flop. Nobody says that about Citizen Kane. I can't help it if not enough people bought the comic in 1971. What do they know? What's that have to do with the greatness of the work? SPURGEON: Do you know how Gødland is going to end? SCIOLI: No. I have a couple of vague ideas, things we've talked about at the very beginning, but I don't know if they're going to end up in the ending or not. Joe and I haven't talked about it lately, but I figure we will at some point soon. * Gødland, continuing series through issue #36, Image Comics. * Myth of 8-Opus: Prologue, July 2008.